Sue’s quilt is a copy of a Baby Jane quilt, taken from a pattern she saw online and challenged herself to make. 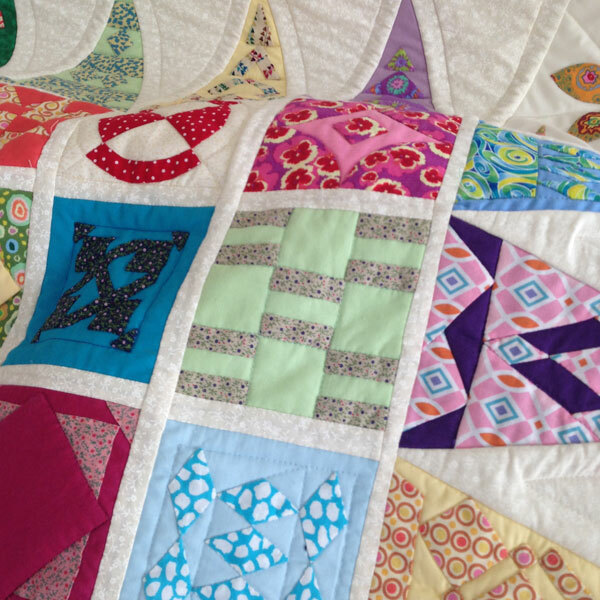 She talks about the significance of the different blocks and colours, how she made the quilt and the history of the original Dear Jane quilt. This was Sue’s second quilt; she talks about the first quilt she made and her plans for future quilt project. Later she explains what quilting means to her. Diane Byrne [DB]: This is Diane Byrne interviewing Susan Price. ID number TQ.2016.029. Location is my home Solihull, West Midlands. The date is 13th of May 2016 and the time is 1.45. Welcome Sue. Thank you for taking part in this interview. Would you, like to tell us about your touchstone? Susan Price [SP]: My touchstone. That’s the one on the corner I believe. [Laughter] Without having too many details on the quilt because I think there are enough details already I’ve merely signed my name, with the date, and I shall leave it at that. DB: That… that’s lovely. So would you like to tell us about your quilt? SP: She’s a… a… a copy of a Dear Jane quilt. I shall call her Sue’s Baby Jane. I found her online. Dared myself to try the first block and thought there’s no way on earth anyone will ever finish that quilt but I’ll see how I go. Started with A1 and basically it was a competition with myself to see if I could ever finish it, and I did. So I feel I’ve completed something as… as in a bucket list. I feel as though I’ve completed something that I’ll never do again and not a lot of people will complete although I know they’d like to. DB: What… what prompted you to do the quilt? SP: I’d done a lot of crocheting and knitting for the last few years and I needed a change and I wanted to get back into sewing but not making clothes like I always used to do. I wanted to do something more artistic and a keepsake. And when you get to a certain age in your life there’s only so much time left. It was now or never. And the Dear Jane when I saw it online it fitted the bill exactly. SP: They are totally random but bright. I like bright colours in everything because I think anything artistic should cheer you up… enrich your life. I don’t like drab colours. I like to look at something and have my spirit lifted which is what I hope I’ve achieved with the one I’ve done. DB: So how do you propose to use your quilt? SP: At the moment I have it hanging on the wall as a work of art and everyone that comes to the house asks if they can see it and they are taken to see my quilt and it’s left hanging on the wall for all to see. DB: So when you get your responses from your visitors how does that make you feel? 0:03:31 SP: Oh wonderful, yeah, it’s a side of me that none of them really knew about. They’re all surprised that I’ve actually done it I think and they all think… they all say well it’s not something I could have ever done and that just makes me feel as though I’ve… I should be leaving something behind when I’ve gone. A thing of beauty. DB: Where did you… when did you first start making quilts? DB: Well you tell us what is next? DB: So are there any other quilt makers in the family? SP: No not quilt makers. My gran and my mother did a lot of sewing when they were with us. They’ve always sewn and I’m very rarely without a needle and cotton in my hands but I’m looking for a new quilt now. Perhaps a machine made quilt rather than the appliqué and the hand sewing that I’ve been doing the last two and a half years. 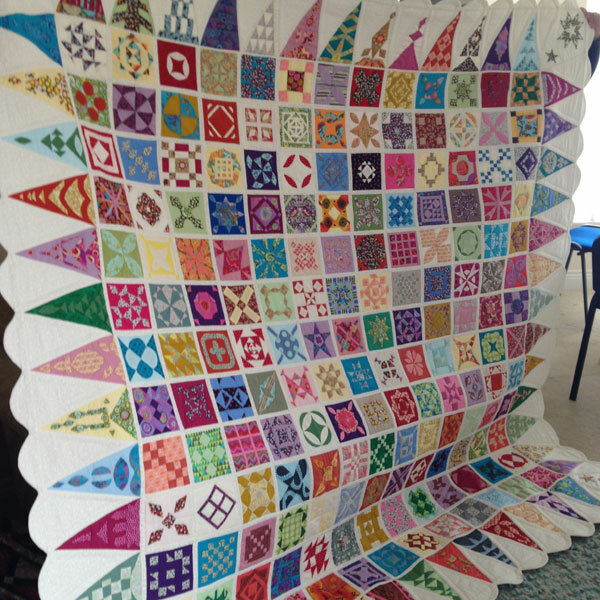 Another colourful quilt but possibly more… more on the machine than by hand this time. DB: You mentioned appliqué would you like to explain to us what appliqué is? SP: Appliqué is when you basically have a background material and you have shapes which you attach to that material, but you have to turn the edges in so that they are not untidy and you can make a pattern on the material with a second material and you can stitch that by hand and that’s quite satisfying. DB: Thank you, that’s helped us. Have you been to any workshops or quilting courses? SP: No I haven’t don’t quilting courses or workshops. DB: So what are your preferred techniques or styles of sort of… are there any particular blocks that you really enjoyed? DB: Very good, is there anything you didn’t enjoy? SP: I think the… the hardest part was putting it together. I enjoy all the… making the pretty patterns but when you come to put it together that’s a very basic thing that… but very important because if you haven’t got your angles right and your corners right it can ruin the whole thing. So I didn’t look forward to that but I made meself do it as I went along so that I hadn’t got too much of it to do at the end if you can understand what I’m saying. DB: Where and when do you do your quilting or your quilts? SP: If I’m machining I have a… a room dedicated to sewing. Appliqué I can do anywhere. Quite often I do it in the evenings while the telly is on if I’m not particularly interested in a programme. We have a caravan. I’ll take it to the caravan with me and do the hand sewing. And any gaps in the day, that I can grab basically, be it machining or the hand sewing. DB: What… how much time do you spend quilt making? SP: Well I can only speak for this particular quilt and for two and a half years I’ve spent probably five days a week possibly two/three hours a day because I knew it was a… a difficult project and I needed to buckle down and… and get it done but I enjoyed it at the same time so I think my next quilt may be a little more relaxing and perhaps, not quite so urgent to get it done. In the… in a time that’s more realistic than two and half years. Perhaps something I can do in a couple weeks but still spend a couple of hours a day. I’m quite happy with that. DB: What do you think makes a good quilt? SP: What makes a good quilt? It’s hard to say when… some quilts you look at and you think yeah that’s nice and then you look at another one and it… it takes your breath away. Personally I think it’s colour placement. And you can see the… the work put into some, it’s… you can see the love that’s gone into some quilts whereas others have just been churned out. But I think basically the colours. People have thought about the colours. DB: Have you been to a quilt exhibition? SP: Yes, yes I’ve been to Malvern quilt show. Many years ago before I ever thought about quilting. Loved the idea but hadn’t got a clue about quilting. Never got round to doing any. And then I went back to Malvern about three years ago and I think, or was it two years ago. I think I’d just started this quilt. And, I was completely taken by everybody else’s quilts but I knew I’d gotta get this Jane finished first before I experimented with any others. So yes and I’m going back to Malvern this year. DB: So… where do you get your ideas and inspiration from? 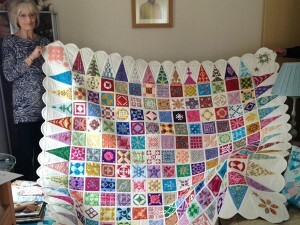 SP: Well so far obviously I’ve only found, Jane Stickle’s quilt on the internet and that’s where mainly I look. But what everybody else is doing and quilting groups online and on Facebook. I love to see what other people are doing and one day hopefully copying them. DB: How do you feel about hand and machine quilting? SP: I enjoy both. I love machine quilting when it’s, basic shapes that go together very quickly. Hand quilting it …it’s… I would… you actually mean the… the quilting and not the… the process that make… making the blocks. SP: I’ve only done machine quilting. I don’t… I haven’t done any hand quilting itself. So that’s something that I need to try. DB: And did you do machine quilting on your Dear Jane. SP: I did all machine quilting. No hand quilting at all. DB: Do you know the story behind the Dear Jane quilt? SP: Well having bought the book and researched online, yes. She was a civil war wife… American Civil War. Husband I think went off to war and, did she… she had some kind of illness and her… her family was, in some kind of material business. Oh and her sons went off to war as well. It was all connected with the American Civil War and she used the typical materials of the day. And, when she was ill and, she had access to a lot of material from her family’s business. She put the quilt together and it’s now hanging in a museum in Vermont. And that would be my ultimate goal to go and have a look at the… the real Dear Jane one day. DB: So when’s that planned for? 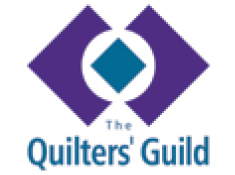 DB: What’s the biggest challenge you face as a quilter today? SP: Like most women finding the time to do it I think. [Laughs] Yeah if I had more time I’d do more quilting. DB: What… why is quilt making important in your life? SP: I know there’s one on there that’s basically different greens and that reminds me of Malvern because I took that block with me and actually sat and put that one together in Malvern which is one of my favourite places, whether there’s an exhibition on or not. I’ve got one or two that I did in Cornwall that remind me of the sea and the waves and the colours that I used at the time were… I don’t know whether it was coincidence but they were the colours of the sun and the sea and the sand. One that’s quite sad. The day my mum passed away. But on another note, it’s a nice memory of her. And quite often I’ll stare at it and suddenly remember a memory that had quite gone but it… it’s so useful to have as a memory jogger sometimes. DB: How did you source your fabrics? SP: Basically just going to quilt shops and material stores and picking out colours that just jumped out at me. Four basic colours. Reds, blues, greens and yellows. And hoping I’ve got an even distribution throughout. Obviously bought far too much of every colour so [Laughs] I’m ready for the next one. DB: How many blocks are in your quilt? SP: There are over 200 blocks I believe. Two six five is it… including the triangles. Let’s just see. 169 [noise] blocks and then the… and then 69, sorry 13… 52 triangles. Yeah. DB: How did you accomplish the scalloped edge? SP: I… Again I used what was [Noise] available. I happened to find a saucer that was just the right size and, basically traced around it onto a paper pattern and then repeated and, it just happened to fit. [Laughs] I’m glad to say. DB: Right you said there was 169 blocks. How did you, fasten the blocks together? SP: In the traditional method of this quilt, there is sashing of half an inch between each block and, I actually did quilt as you go so I completed a row of blocks and then sashed each one together singly. And then across the lines I would sash the 13 in the row and each row is half an inch between each block and… and I didn’t do the back sashing until I had completed several rows. It gets quite… you have to work out mathematically how to do things. Specially as you jump in at the deep end like I did. But the sashing, yes you had to work that out and, that’s more tedious than the other processes I believe. DB: You said you jumped in at the deep end. SP: I certainly did. A1 is probably one of the most difficult blocks on there and that’s the first one I did. 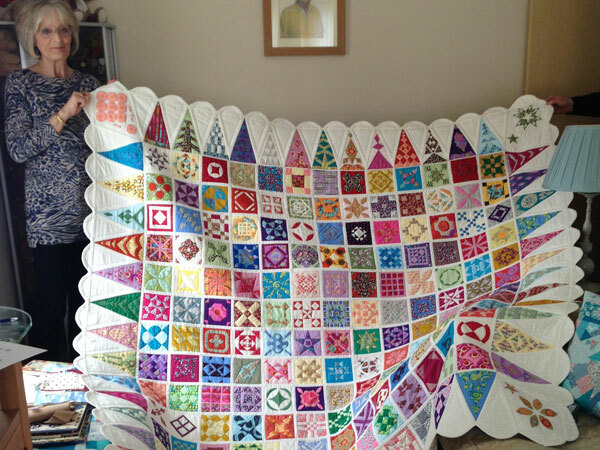 When I saw the quilt first time and thought if I can do that I can carry on and after a couple of nights huffing and puffing I finally got it done and when I looked at the notes about this particular quilt people said if it… if it’s not quite right don’t worry about it just keep going. To me I thought that looks good enough to carry on and… and after this I think I should find things a little more simple. DB: So did you… were there instructions in the book to tell you how to do the blocks? SP: No, no instructions. Just a matter of tracing each block and working out in your own mind the best way of completing the block and making it, as well as you could yourself. It was just giving you the shapes to copy so it… it is up to yourself how you put it together. DB: Right, so you say you had, A1 did you say was the first one? SP: A1 was the first block. DB: Or did they have a name as well? SP: They… oh they had numbers and names. Well the names were given to them by the lady who researched the original maker of the quilt and she wrote her book and gave all the blocks a name and number and the blocks were A1 to 13 right down to M1 to 13 so… and then triangles around the edges, top bottom left side right side. One to 13. And I did them in order because I didn’t want to get in a mess. I wanted to do it as I went along and I could see how I was doing as I went along. DB: Why is it called a Dear Jane? SP: The lady who wrote the book, Brenda Papadakis, wrote the book in the style of letters to the original maker of the quilt, Jane Stickle and throughout the book she puts little snippets of letters that she would have liked to have written to her if she’d have known her. DB: You’ve got, grandchildren what do they think of your quilt? SP: Oh yes they are little ones and they’re now five and seven but throughout the last two years whilst my work of art has been hanging on the wall being completed they tend to lie on the bed and look at each shape and make little stories up about the stars and the trees and the surfboards and their imagination has run quite wild over the last two years and it’s been quite a little talking point for them. They haven’t yet seen it completed. DB: What’s so enjoyable about quilting? Why is it more satisfying than dress making? Less constrained by time and season? SP: I think with quilting you can pick… pick it up at any time of the day. You haven’t particularly got to be trying things on and getting it exactly right to fit. With quilting, it’s… it’s more uniform and, it somehow satisfies a little part of your brain that wants to put pieces together. It’s… it’s a strange concept of buying material, cutting it all up and putting it back together but in a way that you like rather than how it was intended. DB: You said that you’d… you’d bought fabric from, quilt shops. DB: And you bought too much. DB: Sort of how did you buy your fabric? SP: Well most quilt shops sell fabric in, fat quarters which is, a square of material that is, basically a quarter of a linear metre and also you can buy it in, [Noise] the… the squares. 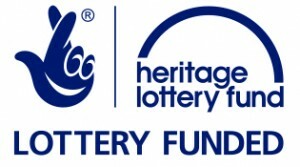 [Interruption and Laughter] Fat eights. [Noise] Charm squares…charm squares. All sorts of ways you can buy material from quilting shops. As long as you buy material and keep a good stash you’ll always have what you want. DB: So you won’t have to buy anymore fabric? DB: You say that you’ve had, friends and family come and look at your quilt, have you had, any outside interest shown? SP: Yes, I was most surprised being a member of several different quilting groups on Facebook I was contacted by the writer of the book, Brenda, who asked if I’d be interested in exhibiting it in Houston, Texas later on in the year. Although it sounds a lovely idea I’m afraid my quilt’s too precious for it to go anywhere without me. And, I’ve had to say no. And I also had a lady in France, there’s an exhibition in, Alsace in an Amish community and she picked up, my quilt also on the Facebook group and asked if I’d be willing to let it go over there. Again, I just can’t possibly… my feeling is that, I… I would be worried every minute that it was away from me that my precious work of art might not find its way back so… anyone can come to me but I’m afraid that’s where it’s staying. DB: Thank you. I think that concludes this interview. The time is now one… sorry two. 2:20. Length of the interview 35 minutes. Thank you Sue.